The battle to avoid relegation from the All Ireland League will go down to the last day of the season after Annadale and Cookstown both lost on Sunday. Basement club Annadale were beaten 5-2 at home by Pembroke Wanderers and they remain two points adrift of Cookstown, who lost 2-1 to Lisnagarvey. There is also a three-team contest to see who will secure fourth place and make the Champions Trophy play-offs. This involves Glenanne, Pembroke and Three Rock Rovers. At Lough Moss goals from Matthew Crookshanks and Andrew McKibbin weren't enough to keep Annadale from another heavy home defeat as Irish international Alan Sothern scored twice for Pembroke Wanderers with other goals from Timothy Hill, Nick Burns and Jason Lynch. For Annadale to avoid a return to the Ulster Senior League next season they will have to beat Irish Senior Cup winners Monkstown on Saturday in Dublin and hope Cookstown get nothing from their game at Three Rock Rovers. Should the County Tyrone side draw then goal difference would come into the equation. Cookstown pushed Lisnagarvey all the way on Sunday but couldn't stop the champions recording their 15th straight win despite resting internationals Paul Gleghorne, Jonny Bell, Michael Watt and Timmy Cockram. James Lorimer gave Garvey the lead but Ryan Millar equalised for Cookstown in the third quarter. It was a late strike from Andy Williamson that gave Garvey the win and means Cookstown are still in danger of making the drop. Should they avoid the one automatic relegation spot, the side that finishes ninth will still face a one-off game against the runners-up of the promotion play-offs, with the winners either retaining or securing All Ireland League status next season. Mathematically, on goal difference Cookstown could still avoid that scenario with a win next Saturday and two defeats for Cork C of I, whose game with Monkstown was postponed on Sunday. 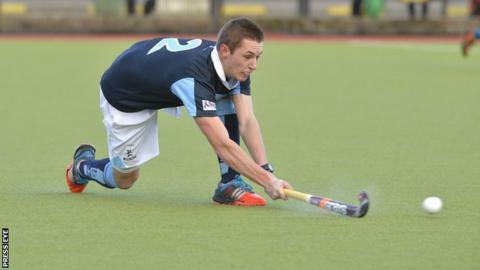 With Lisnagarvey, Monkstown and Banbridge already through to the Champions Trophy play-offs, it's Glenanne who are in the driving seat to join them as they moved up to fourth in the standings with a 3-1 win over Railway Union. They only hold a one-point point advantage over Pembroke and two over Three Rock, who were beaten 2-1 at Banbridge, with Stephen Dowds and Owen Magee getting the goals for Bann.